Mulching is one of the easiest, quickest, and most cost-effective things you can do to support the health of your tree. However, if you don’t mulch correctly you could do more harm than good to your trees and shrubs. In this article we will go over the benefits your trees and shrubs receive from mulching, what can go wrong when you improperly mulch, and how to mulch properly! Almost doubles the growth rate of newly planted trees. Walnut trees experience an 89% increased growth rate while other hardwoods (oak, maple, hickory, birch, beech, and cherry trees) experience an increased growth rate of 79%. Keeps out weeds to help prevent root competition. What Could Happen If I Mulch My Tree Incorrectly? 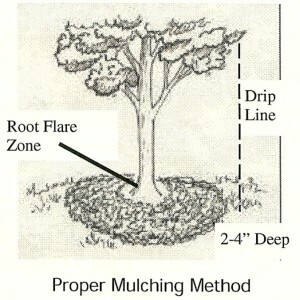 If you’re mulching your tree incorrectly you can expect to see some of the issues below. Increased susceptibility to insects & diseases caused by mulch irritation on the trunk of the tree. Girdling Root Systems – a condition where smaller roots wrap around a dominate root choking it and not allowing the tree to absorb nutrients. Rodent issues – mulch piled high against the trunks of trees create habitats for rodents that chew the tree’s bark. Now that you know the benefits of mulching and what happens when things go wrong, it’s time to make sure you’re actually mulching correctly! We see a lot of incorrect mulching around the area which can cause more damage to the tree than benefits. Make sure you’re mulching correctly by following our tips below. Size: How Far Out Should I Mulch? The best mulching goes out as far as the tree’s canopy (referred to as the drip line of the tree). Mulching this far out covers the entirety of the tree’s critical root zone. However, this isn’t realistic for most homeowners because 1) they don’t like the aesthetics of this and 2) for small properties with big trees, the tree canopies may extend into their neighbor’s yard or take up the majority of their property leaving no room for grass. 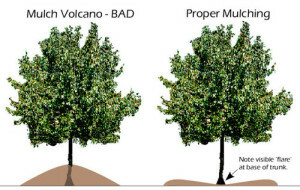 If mulching out as far as the canopy extends isn’t practical, our Arborists suggest apply mulch in a 2 to 3-foot radius around the tree instead. Depth: How Deep Should My Mulch Be? You’re mulch should be about 2-4 inches deep. Most mulching you see probably is a lot deeper than this, as over-mulching is one of the most common mulching mistakes. It’s become a common industry practice for landscapers to pack 6-12 inches of mulch up around the base of the tree in order to make their customers happy; however, this over-mulching is very bad for your tree and can lead many issues that we discussed earlier in the article. If you want to receive all the benefits of mulching without the dangers of over mulching, make sure your mulch is only 2-4 inches deep! 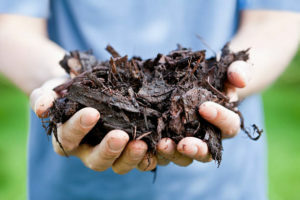 Learn The Most Common Mulching Mistakes Homeowners Make: Mulch Madness: 5 Common Mulching Mistakes. What Should I Do If I’ve Been Incorrectly Mulching? If this is the first year your tree has been over-mulched simply go out and remove or spread out the excess mulch. Use the proper mulching techniques in this article to make sure you redistribute your mulch correctly. If your tree has been over-mulched for years you will most likely need a few treatments to get it healthy again. 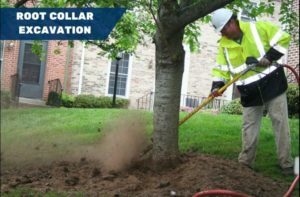 Root Collar Excavation: this process opens up the tree’s root zone using pressurized air. This doesn’t hurt the tree’s roots and allows the arborist to inspect the root system to see if there are girdling roots or root rot. 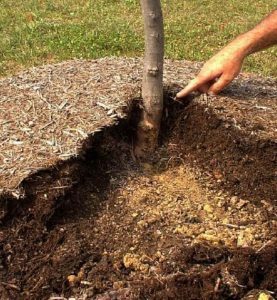 Treatments: based on what is found during the root collar excavation your tree may need treatment for root rot or root pruning to trim back the girdling roots. Bio-stimulants: since your tree has been kept in an unhealthy situation for years, bio-stimulants can be used as a multi-vitamin to make sure the tree has all the nutrients it needs to strengthen its immune system and recover from improper mulching. 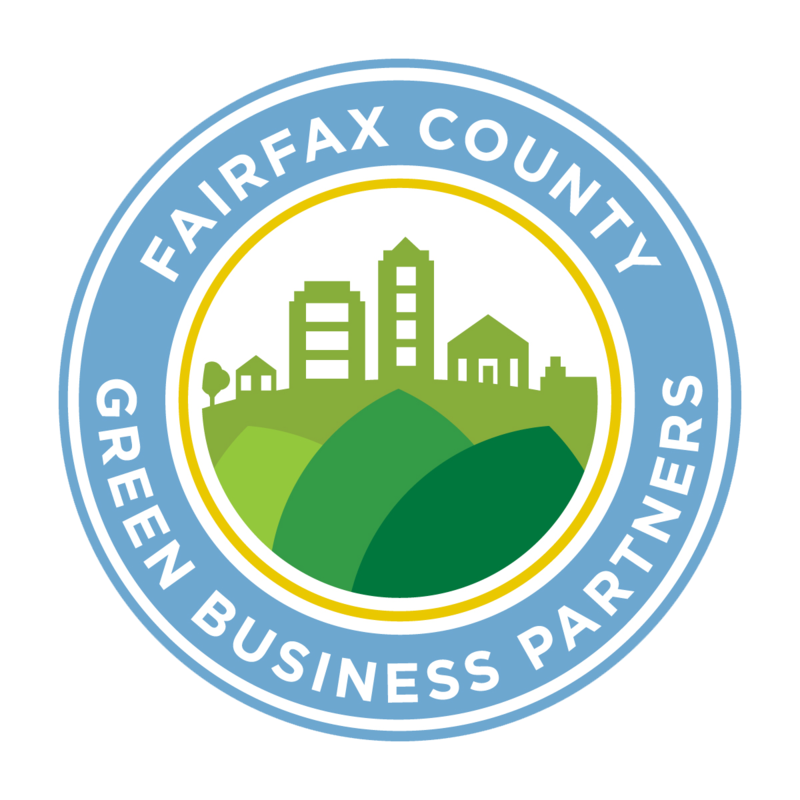 If you need help restoring your tree’s health after improper mulching give us a call at 703-573-3029 or book an appointment online. Know that you know the proper way to mulch, we look forward to seeing properly mulched trees and shrubs on all of our clients properties this season!